"I didn't want a real job, I wanted adventure." Sony Pictures Classics has debuted an official trailer for the documentary Maiden, which first premiered at the Toronto Film Festival last year. This outstanding doc is playing at the Sundance Film Festival next this month, which is why this trailer is debuting just in time to help build some extra buzz. This is really worth a watch - it's a moving, inspiring, remarkable story of how one young woman organized the first ever all-women sailing team to compete in the Whitbread Round the World race in the 1980s. The film is about Tracy Edwards, who put her entire life savings and every last ounce of effort into finding, training, commanding, and sailing with a team of women - the first ever in this world famous sail boat race. The film features jaw-dropping footage of their race, and interviews with the entire sailing team, telling us all the brutally honest stories of what went down and how they pulled this off. 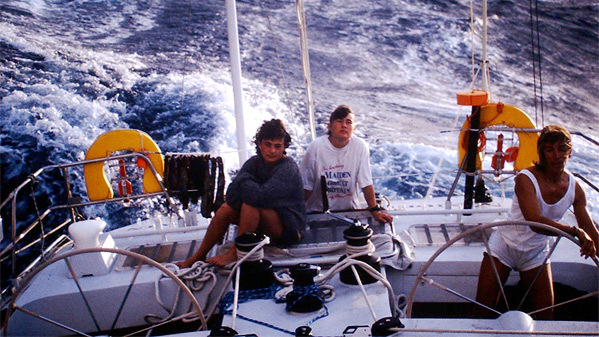 Maiden is the story of how Tracy Edwards, a 24-year-old cook in charter boats, became the skipper of the first ever all-female crew to enter the Whitbread Round the World in 1989. Tracy's inspirational dream was opposed on all sides: her male competitors thought an all-women crew would never make it, the chauvinistic yachting press took bets on her failure, and potential sponsors rejected her, fearing they would die at sea and generate bad publicity. But Tracy refused to give up: she remortgaged her home and bought a secondhand boat, putting everything on the line to ensure the team made it to the start line. Although blessed with tremendous self-belief Tracy was also beset by crippling doubts and was only able to make it through with the support of her remarkable crew. With their help she went on to shock the sport world and prove that women are very much the equal of men. Maiden is directed by producer / filmmaker Alex Holmes, his second film after directing Stop at Nothing: The Lance Armstrong Story previously. This first premiered at the Toronto Film Festival, and is playing at Sundance next. Sony Classics will then release Holmes' Maiden in select theaters starting sometime in early 2019 - stay tuned. Who's interested?